It's known by some as the three-star island with the five-star hotels, but that's not saying enough for the white sandy beaches or the forested highlands in the southwest. And maybe it's not saying enough for the hotels either, many of which are six-star retreats staffed by some of the nicest people on the planet. Of all the luxury hotels on Mauritius, few are as stylish or as welcoming as the Beachcomber group of resorts. Beachcomber’s Dinarobin Hotel Golf & Spa boasts a superb setting on the private Le Morne peninsula – there is a dramatic mountain to one side and the sparkling sea to the other. Dinarobin could hardly be better located. Guests enjoy a choice of luxury accommodation including sumptuous suites positioned directly on the beach. The hotel’s friendly staff offer flawless service, and delicious cuisine is available in a choice of seven restaurants, four of which can be found along the beach at Dinarobin’s sister hotel, the Paradis Hotel & Golf Club. The Dinarobin is home to one of the island’s finest spas. It also boasts spacious grounds, a choice of watersports and a free Bob Marlin Children’s Club for kids aged 3 to 12. 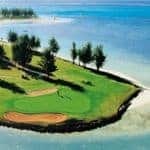 For golfers, the Paradis has an 18-hole golf course right on your doorstep, plus there are a further two courses available locally where guests of the Dinarobin enjoy VIP service and discounted green fees. 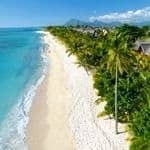 Beachcomber Tours has specialised in selling tailor-made luxury holidays to Mauritius for more than 20 years and offers a choice of seven Mauritius hotels perfect for an indulgent break, a family holiday, a honeymoon or a wedding abroad. 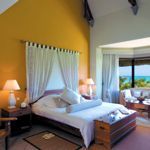 Click here for more about Dinarobin, Beachcomber’s other luxury hotels in Mauritius and the latest special offers. Find the best time to visit Mauritius and the review of Beachcomber Tours.